. :: CSI*** SHARM EL SHEIKH ::. Concorde El Salam Hotel Sharm El Sheikh, from September 30th until October 10th 2010 - hosted the Egyptian International Equestrian Championship and show jumping CSI*** World Cup qualifier. 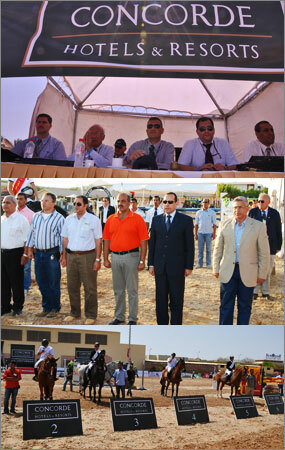 16 countries participated in the competitions which were held on the grounds of Concorde El Salam Hotel Sharm El Sheikh that holds two equestrian arenas equipped according to International standards. And under the organisation of HORSE TIMES magazine and the sponsorship of Concorde El Salam, International rider and British number 1 show jumper Ben Maher participated at the event. This is the second year for the hotel to host those championships showing much success in organisation along with fully hosting riders and their horses, officials and guests. General Mohamed Abdel-Fadil Shousha, Governor of South Sinai attended the closing ceremony of the tournament and was welcomed by Samir Rashwan, General Manager of Concorde El Salam Hotel Sharm El Sheikh.